"Sampath Speaking" - the thoughts of an Insurer from Thiruvallikkeni: Crores of currency and 73 Sov seized from house of folk artist in Vellore. Crores of currency and 73 Sov seized from house of folk artist in Vellore. Muthiah and Kamakshi were names of the characters in that famous movie which is most remembered for the banana (Vazhaipazham) comedy of Goundamani and Senthil. No prize for guessing it to be ‘Karakattakkaran’ ~ movie released in 1989, directed by Gangai Amaran starring Ramarajan, Kanaka which ran for 400+ days. In the movie, Goundamani will give Re.1 and send Senthil for buying 2 bananas… Senthil would buy 2 – eat one and present ‘the other’ … when asked – he would say ‘this is the other one’ …. The Q gets repeated multiple times, in different tones – ‘I gave Re.1 – you bought two – one is here – where is the other’ …. Pat comes reply ‘this is the other one’ ~ making it a hilarious comedy of all times. Karakattam is an ancient folk dance of Tamil Nadu performed in praise of the rain goddess Mariamman. The performers balance the water pot on their head very beautifully. Earlier it was performed only with the accompaniment of the naiyandi melam, but now it also includes songs. In the Karakattam, intricate steps and body/arm movements decides the skill of performer. The pots are decorated in many ways with the help of attractive flower arrangements, topped by a moving paper parrot. The parrot rotates as the dancer takes swings along these looks beautiful. Some experts also dance standing over a plate i.e. rim of the plate, filled with water, without spilling water out of the plate while balancing the karakam on their head. Most expert artistes are from the regions of Thanjavur, Pudukkottai, Ramanathapuram, Madurai, Tirunelveli, and Pattukkottai and Salem, Tamil Nadu. 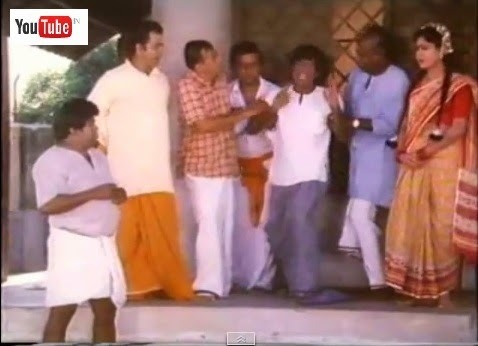 The movie Karaga Attak Karan based on the folk dance was a great hit mainly thanks to the melodies of Illaiyaraja – with song, "Maanguyilae Poonguyile sethi onnu kelu." blaring throughout the State. The folk artists are not generally taken care of well – as the support for such traditional arts has gone down – they eke out a very ordinary living, struggling to meet their ends meet. The newsitem below of Indian Express (and other local dailies) is for sure an aberration…. Sad to read the art in news for wrong reasons – due to crime committed by a person, who happens to be an artist performer. Vellore : A day after stumbling on a huge haul of cash and gold ornaments from a folk artiste’s house at Tharapadaveedu on Sunday, police sealed the houses of the artiste’s relatives in Vasanthapuram and launched a search for her. Acting on a tip-off that Mohanambal (50), a folk artiste and a resident of Vasanthapuram near Vellore Corporation Office, had stacked crores of rupees in her rented house, the police cordoned off the stretch of Govindaraj Mudaliyar Street in Tharapadaveedu on Sunday morning. With the help of the house owner Jamuna (55), who was also a folk artiste, the police contacted Mohanambal over the phone and asked her to reach the house immediately. But after waiting till 5 pm for Mohanambal, police decided to force open the portion of the house. The six-hour raid that ended at 11 pm was videographed. The police obtained permission from the Executive Magistrate and broke open the house in the presence of Revenue Inspector A C Vinayagamurthy, VAO G Dilip Kumar, house owner Jamuna and appraiser M Murthy. In the tiny rented portion measuring 70 sq ft, the police team found cartons of currency notes. District police sources said that 313 bundles of `1000 denomination currency notes amounting to `3.13 crore; 183 bundles of `500 denomination currency notes amounting to `91.50 lakh;and `23,500 of various denominations of currency notes were found in cartons, gunny bags and small carry bags. “The bundles stuffed in the gunny bags were found beneath a dining table. Apart from the cash, we seized 599.600 grams (73 sovereigns) of gold ornaments and deposit bond paper worth `6.60 lakh from the house. We found the name of one Nirmala in the bond paper,” said a police officer. The police team were surprised to see the huge amount of cash in the house. In fact, the police team carried out the raid under a veil of secrecy. The seizure of the cash came to light around 9 pm on Sunday. The enquiry disclosed that Mohanambal took two portions of Jamuna’s house for a monthly rent of Rs.1500/- two months ago. She told Jamuna that she needed the portion where she could safely keep her belongings. Superintendent of Police P Vijaykumar told Express that a case was registered under Section 102 of the CrPC and seized the cash and jewels. “The seized valuables and cash would be produced before the Executive Magistrate of the jurisdiction.” The police has also sent a photocopy of the FIR of the case to the Magistrate of the Judicial Magistrate Court in Katpadi. The SP formed special teams under DSP of Vellore Panneerselvam and inspector and Investigation Officer of the case A T Ramachandran to track down Mohanambal, who is at large. The police have sealed six houses, including that of one Saravanan, a habitual offender, in Vasanthapuram and are conducting an enquiry to find out of the source of the cash and jewels.